Harvested on Tuesday 7 January- that has to be a record for tomato harvesting lateness? The fact it was a yellow pear in that planter means something strange has definitely gone on with my seed sowing? 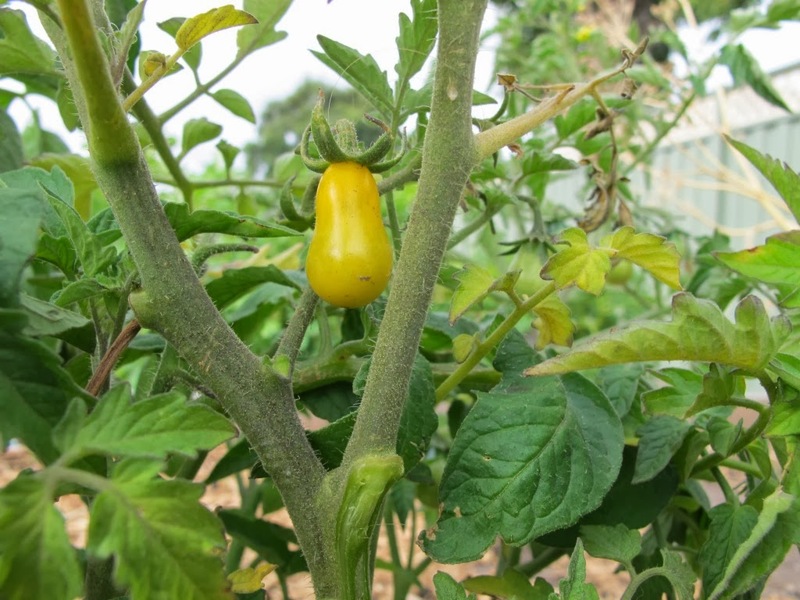 There are little baby pear shaped tomatoes springing up everywhere! in the planters and in my back garden. It's strange because last year I got two spindly little 'yellow pear' plants very late in the piece from our local veggie swap. They were soon swamped and over-shadowed by the standard cherry tomatoes- (I call them 'feral cherries' because they seem to spring up everywhere). All in all I must have harvested only about 3 or 4 'yellow pears' last year. One of which I kept for seed. Normally the way this works is that I take the seeds and spread them onto a piece of paper towel. I write the name of the variety on the paper towel fold it in half an put it on the window sill to dry for a few days or so. After that I pop the piece of paper with the seeds still stuck to it into an envelope, maybe with a couple of other folded up pieces. When it comes time to plant the seeds I peel each seed gently off the paper. It's amazing that so many seeds from just one tiny tomato have managed to grow and I am pretty sure they were supposed to come from the piece of paper that said regular 'feral' cherry so I am thinking that in some stage of the process the yellow pear got mixed up with the 'feral cherry'. I am wondering even if they have cross pollinated? I will find out when the others ripen. 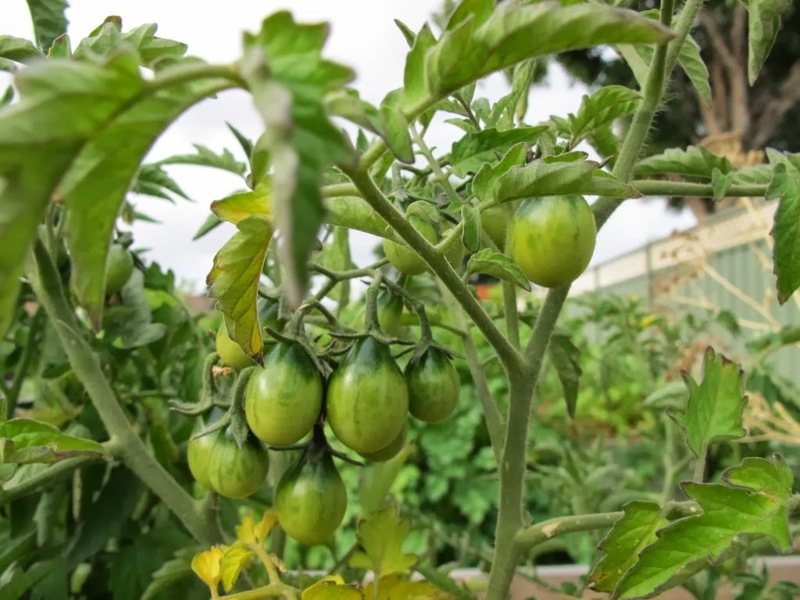 In other tomato news down at the community garden plot where I am testing Bek's varieties the only ones that appear to have fruit at last count were the Ned Kelly and the Big Beef. With hot weather finally on the way I am looking forward to some more tomatoes soon. The blogosphere is full of gardening and self sufficiency blogs. People are doing an amazing job- growing and raising, cooking and preserving their way to self sufficiency- I salute you all! My challenge is simple, eat at least one ingredient either grown in my garden or sourced from friends and colleagues every day. My garden is in a small suburban block. The challenge is the two large gum trees planted by my predecessors. As they provide a beacon for local wildlife and a cool oasis from the summer heat, I am stuck with the trees. My partners in my challenge are 'Boss' (my Barnevelder chook) and her daughters 'Maud' and 'Little One', who aside from the occasional egg provide endless garden amusement.